Fortnite Season 6 is well underway and this season is shaping up to be a spooky one. The island in the middle of Loot Lake has taken to the skies with the power of the mysterious purple cube and all kinds of new landmarks have popped up around the map. To help to keep track of everything, we’ve put together this handy little guide. Here you’ll find the Fortnite Season 6 end date, Battle Pass details, map changes, weekly challenges, new skins, and more! Check back frequently to stay up-to-date on the ever evolving world of Fortnite! When did Fortnite Season 6 start? Fortnite Season 6 kicked off on September 27, just one day after the first anniversary of the smash hit Battle Royale game mode. For a deep dive into some of the Season 6 map changes and more, check out the sections below. The Fortnite Season 6 end date is expected around December 6, which is 10 weeks after the season began. That said, Season 5 ran about a week long, so don’t be surprised if it lasts into the second or third week of December. Like the previous seasons, the Fortnite Season 6 Battle Pass costs 950 V-Bucks, or about $10. Working your way through all 100 tiers of the Battle Pass will net you more than 100 unique rewards. Simply buying the pass also unlocks two skins, Calamity and DJ Yonder. Read more about all the Season 6 rewards below. What are Shadow Stones in Fortnite? Shadow Stones are a new item in Fortnite Season 6 that spawn in Corrupted Zones around the map. Consuming a Shadow Stone will enter you into Shadow Form for 45 seconds. During that time you move faster and gain the ability to phase forward, but can’t fire any weapons. Fortnite Season 6 kicked off with a whoosh as the island at the center of Loot Lake began floating with the power of the mysterious purple cube. It slowly floated around the map activating runes in each of the corrupted zones it left behind in Season 5. You could still access the top of the island (and the house on it) at the start of the season, where there’s some sparse loot and a few destructible objects. Walking into the vortex beneath the island will send you flying into the air. After each of the runes had been activated, they floated toward the island on their own, with a similar vortex beneath them. At the end of October, they met with the cube and broke the island apart, kicking off the Fortnitemares event and wreaking havoc around the map. For several weeks the corrupted areas contained Corrupt Fragments which spawned two different types of spooky Cube Monsters: Cube Fiends and Brutes. This was the first time non-player characters could be found in Fortnite: Battle Royale. On November 4th the cube exploded, sending all players currently in a game into a strange alternate reality. A cutscene played where each player character watched as a butterfly landed on it’s fingertips. Afterwards, everyone was teleported back to a cube-less map with a new island at the center of Loot Lake. A couple of other new areas and features have popped up around the map this season as well. Spooky corn fields have sprouted up in the Fatal Fields region. Visibility is limited while running through the field, but they can be chopped down by swinging your ax. Finally, a Haunted Castle has appeared at the top of the Haunted Hills. Loot and several chests spawn there, so there’s more to check out than just paranormal activity. Only time will tell what will happen in Fortnite Season 6. Will the runes collide with the massive island to kick off another Halloween event? Knowing Fortnite and Epic Games, it’s anyone’s guess. Like every season before it, there are a number of new skins in Fortnite Season 6. With the subtitle “Darkness Rises”, many of them are Halloween themed but there are a few timeless skins that shouldn’t be missed out on. First up are the two skins unlocked by simply purchasing the Battle Pass: Calamity and DJ Yonder. Cowgirl Calamity can be further customized by changing her highlight color, which has a bigger effect as you gain more parts of the outfit by unlocking higher tiers throughout the season. 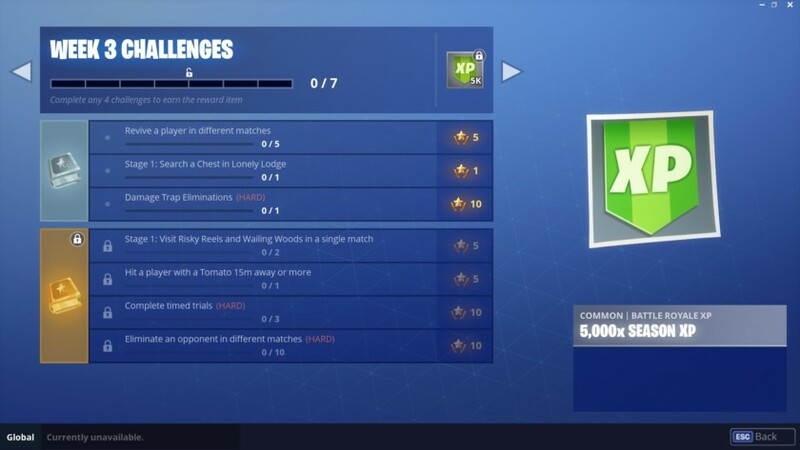 Make sure you complete challenges to unlock more colors! Next up is the inflatable llama riding Giddy-up available at Tier 23 and the dark Red Riding hood lookalike Fable available at Tier 47. She’s part of the new Red Riding set that includes an ax, picnic blanket glider, fireflies contrail, and of course, a red cape back bling. On a spookier note, the vampire themed Dusk skin is available at Tier 71 along with a number of batty accessories. The wacky Nightshade is a cross between the Tomatohead and Fate skins, and is unlocked at Tier 86. Finally, the Season 6 level 100 skin is Dire, an unassuming skin that transforms into a werewolf as you gain experience. Really only the first 3 tiers of the skin are unique, as the others are just recolored versions of the same model. There’s also a sweet katana back bling, just because. The Fortnitemare event kicked off on October 24, and with it came yet another new skin called Deadfire. Sticking with the Wild West theme established with Calamity, Deadfire is a gun toting, Cube Monster-hunting cowboy. The legendary skin is available in the item shop off-and-on during the Fortnitemares event for 2000 V-Bucks. His ax is only epic (but equally badass), and costs 1200 V-Bucks. Like other reactive skins, Deadfire and his ax evolve as you meet certain conditions. In this case, dealing damage to players or Cube Monsters will slowly turn Deadfire into a glow-in-the-dark predator with purple and florescent green accents. One surprise addition to Fortnite Season 6 is Pets. These furry friends hang out in your backpack and react to certain game situations by growling, ducking, and so on. Sneaky players can rest at easy, as Bonesy the dog’s growls and barks will not give you away. They can only be heard by you and your teammates. Like other unlockables in Fortnite Battle Royale, they have no effect on gameplay and are purely cosmetic. They do look quite concerned when you get knocked, which is more than can be said about most teammates. To date, just 3 pets have been released in Season 6 of Fortnit, and all of them are unlocked by purchasing the Battle Pass and making your way through the tiers. What pets are available in Fortnite Season 6? Currently Bonesy the dog, Camo the chameleon, and Scales the dragon are the 3 pets available in Fortnite. Bonesy is unlocked first at tier 12, with 2 additional colors available at tiers 59 and 90. Next up is Camo the chameleon, who is unlocked at tier 29. Although Camo doesn’t have any bonus color options, she does change color while equipped. Because, you know, she’s a chameleon. The final pet is Scales the dragon, unlockable at tier 43. Like Bonesy, Scales also features 2 additional color options, which are gained at tiers 74 and 98. Snag all of the great Season 6 rewards by completing all of the weekly challenges. Remember that since Season 5, there are both Free Pass Weekly Challenges and Battle Pass Weekly Challenges, so everyone can get in on the action. However, if you want to snag the bonus experience you’ll need to complete at least one of the Battle Pass Weekly Challenges. Earn an extra 5,000 experience each week for the first 5 weeks, then 1,000 more each week up to a maximum of 10,000 in Week 10. Previous weekly challenges are up for grabs even after the following week starts, so we’ve compiled all of them below along with their rewards in reverse chronological order (the most recent week first). We’ve also included some handy tips for the trickier challenges. The easiest way to get 30 seconds of air time is to grab a vehicle and drive over the airlifts near corrupted areas. The 30 seconds don’t need to be consecutive, so just chip away at the challenge little by little. If you want to really show off, grab a friend and go for the Quadcrasher and Balloons technique. If the player with the balloons is sitting in the passenger seat, both of you can fly high above the map, completing the challenge in just a few minutes. Where are the Carnival Clown Boards in Fortnite? Carnival Clown Board locations are scattered around the map. You only need 3, but there are at least 5 to find. Where are the fish trophies in Fortnite? Dusty Depot: One in the bathroom of Dusty Diner and another in the office building. Fatal Fields: Inside the biggest house above the fireplace. Greasy Grove: Several on the walls of the camping shop. Haunted Hills: Inside the newly added castle in the throne room. Junk Junction: Inside the main building above a bed. Lazy Links: Behind the counter of the golf shop. Lonely Lodge: Near the fireplace in the main building. Lucky Landing: In one of the diner buildings in the Southeast part of the area. Paradise Palms: Above the desk in the car dealership. Pleasant Park: In the outdoor picnic area in the center of the park. Retail Row: Several on the walls of the fishing shop. Risky Reels: Inside on the second floor of the projector building. Salty Springs: In the basement of the blue house. Shifty Shafts: Inside one of the shacks in the East part of the area. Snobby Shores: One in the garage of the second house from the North and another in the basement of the Southernmost house. Tilted Towers: On the floor in the broken building. Wailing Woods: Inside the large cabin. Where are the Clay Pigeon Shooters in Fortnite? Near the river West of Risky Reels. On the shore Northeast of Leaky Lake. In the clearing west of Pleasant Park. Near the giant chair Southwest of Shifty Shafts. Near the river South of Paradise Palms. How do you get trick points in a vehicle in Fortnite? To get trick points in Fortnite you need to perform flips, spins, or twists while in an airborne vehicle. Find a Shopping Cart, ATK, or Quadcrasher and drive it off a cliff or ramp of your own making to start racking up points. Just make sure you land it, otherwise you won’t gain any points. Where are the trees, rocks, and cars in Fortnite? The best places to destroy trees in Fortnite are Wailing Woods and Dusty Depot. For rocks, head to the quarry near Lazy Links. Cars can be found in any of the populated areas, but the easiest place to find them is Risky Reels. How do you skydive through rings in Fortnite? The rings spawn in the air, so the easiest place to complete the challenge is right after you drop. Although the challenge specifically says skydive, you can also glide through the rings, which is significantly easier. You can snag up to 4 rings per drop, so you should be able to finish this challenge in just a handful of matches. Where are apples in Fortnite? The best place to find apples in Fortnite is the wide area near Wailing Woods and Tomato Temple. They spawn randomly, so you might have to search around to find them on the ground. Keep in mind that you can’t consume them at full health, so chop down a tree or two and build up. The fall damage from 4 levels or higher will do the trick. Sheet music in Pleasant Park: Found inside the house in the center-North part of Retail Row. There is a giant spider in the yard, and the sheet music can be found on the first floor behind the first door on the left. Piano near Pleasant Park: Large piano keys and the sheet music you found previously are located on a hill just West of Pleasant Park. It’s easy to spot while gliding down. Just follow the notes on the sheet music and finish the math for completion. Sheet music in Retail Row: Found inside the long building on the East edge of Retail Row. Enter the Southernmost door beneath the awning and grab the sheet music just to your left. Piano near Retail Row: Like before, large piano keys have spawned on the map. Find them on a small ridge Southeast of Retail Row. Playing the notes might be complicated since they’re located near a Corrupted Fragment, so make sure the area is clear before proceeding. Where are the radar signs in Fortnite? How do you record a speed of 27 or more on radar signs in Fortnite? In order to reach 27 mph, you’re best off sticking with Fortnite’s true vehicles. That means either an ATK at full speed with a boost, or the newly added Quadcrasher. Sorry shoppers, the Shopping Cart is not gonna cut it. Also keep in mind that you’ll need to record a speed of 27 on 5 different radar signs, so going through the same one several times won’t work. Be sure to finish out the game, as well, otherwise you may not get completion credit. Where are the Flaming Hoops in Fortnite? Doorbells are found, unsurprisingly, next to the front door of houses. Just interact with them as you would a chest, Shadow Stone, and so on. Land in residential areas and ding-dong-ditch your way to challenge completion. Where is the Clock Tower in Fortnite? A Clock Tower can be found in the still-popular landing sight of Tilted Towers. Land on top of it and boogie down to snag an easy 5 Battle Stars. It’s also worth noting that you can repeat the same Shooting Gallery for credit in a new match, so you don’t need to go too out of your way to complete the challenge. Make sure you finish the match afterwards though, as you may not receive credit otherwise. How do you get the Tomato in Fortnite? Tomato is available as a toy at Tier 28 of the Battle Pass. If you’re falling behind on tier unlocks in Season 6, hold off on this one for a little while. The good news is that hitting a teammate with a Tomato also gives credit, so queue up with your friends or hop into a 50 vs 50 to grab your 5 Battle Stars. 50 vs 50 is an easy way to complete the revive challenge as well. Where are the Timed Trials in Fortnite? As long as there are no enemies around to ruin your day, they aren’t too difficult to complete. Once you start the Timed Trial, you can scope out the path before starting. Many of them also require building, but you can even build before starting to give yourself an even easier time. This is particularly useful for mobile players, as building isn’t quite as quick as it is for mouse-and-keyboard users. Where are the Corrupted Areas in Fortnite? Where are Shadow Stones in Fortnite? Shadow Stones can be found near any of the Corrupted Areas, as listed above. Just walk up to them and interact just as you would a chest, door, mushroom, and so on. Where are the Streetlight Spotlights in Fortnite? The easiest way to go about finishing the challenge is queuing up in 50 vs 50 mode and flying over areas until you spot the spotlight. Hop inside and bust a move to grab an easy 10 Battle Stars. What are the Named Locations in Fortnite? Named Locations are just that – places on the map that are marked with names. There are 21 in all, including Dusty Divot, Tilted Towers, Lucky Landing, and more. That’s all for this guide to everything Fortnite Season 6. What are you most looking forward to this season and what would you like to see in Season 7? Let us know in the comments!